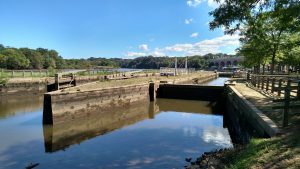 The Raritan River is often overlooked in courses taught at Rutgers New Brunswick, yet it provides ample opportunities for research and discussion. Last fall, Dr. Jean Marie Hartman, Associate Professor at the School of Environmental and Biological Sciences, taught an interdisciplinary honors seminar called, “Tracing the Raritan”. This seminar combined field trips and site visits with readings, discussions, and map making to understand the interplay of the many forces that shape this major element in the local environment. Dr. Hartman recognized the opportunity that the students’ final projects about the Raritan River presented. Beginning in late May 2017, with funding provided by the Rutgers Raritan River Consortium mini-grant program, Dr. Hartman hired Nathalie Adam (SEBS 2020) to review final projects from students who took the “Tracing the Raritan” course for material to use in a separate presentation. Nathalie chose four of the students’ presentations and worked to edit the material into one short presentation that could be made available to incoming and current Rutgers students as an introduction to the Raritan River. Her tasks involved verifying the information, identifying sources of photos, and creating a final product that is both informative and interesting. Nathalie also learned to do voice over on the PowerPoint presentation, which required additional editing of the narrative and repeated practice sessions. To view the “Raritan Welcome” presentations, click on this link to open the Google drive. In addition to the presentations, the interns worked with Heather Fenyk, Executive Director of the Lower Raritan Watershed Partnership, to make a map of the Lower Raritan Watershed that shows sub-watersheds, municipalities, and streams. 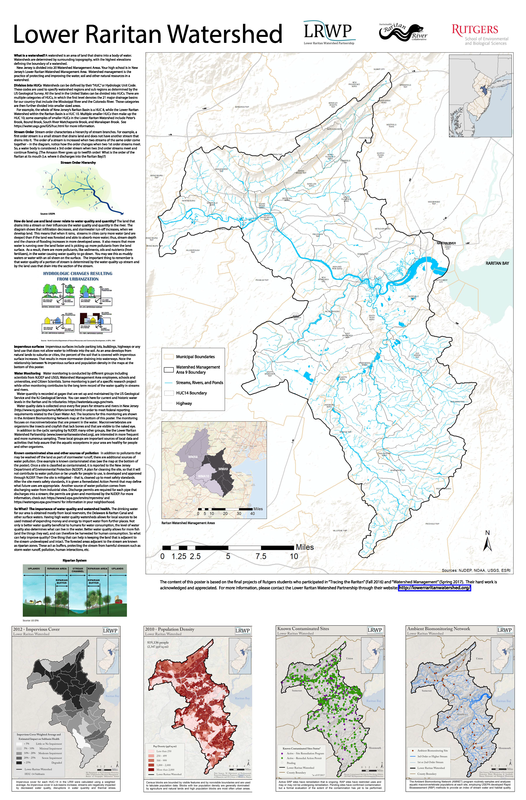 A short tutorial about watersheds is provided on the poster. This map is being distributed to local high school science teachers in the Lower Raritan area along with a PowerPoint lecture that the teachers can use for preparation or in class. For more information, contact Dr. Jean Marie Hartman at jhartman@sebs.rutgers.edu.